Ever since J P Dutta started making his Umrao Jaan he has been shouting at the top of his voice that he is not remaking Muzaffar Ali’s Umrao Jaan but is making a film based on Mirza Mohammed Hadi Ruswa’s novel. After seeing the film, one can believe this because this Aishwarya Rai is a very different film, and far truer to the 1904 Ruswa novel. This is Bollywood’s fourth attempt at adapting the classic novel. The plot goes thus: A little girl, Ameeran, from a lower middle class family in Faizabad is kidnapped and sold to a brothel in Lucknow. Played by Aishwarya Rai, she grows up to be the most famous nautch girl of her times and is re-christened Umrao Jaan. While performing her first mujra she falls in love with Nawab Sultan (Abhishek Bachchan) and vows to be loyal to him all her life. However fate decides otherwise, and Umrao ends up losing him after the Nawab’s father throws him out of his home. Umrao decides to wait for her lover, even as the dacoit Faiz Ali (Sunil Shetty) wants to woo her. The film is a journey of a woman who is living a life born out of circumstances, and has no control over her own destiny. Though the courtesan wants to live like any other woman, that isn’t her destiny; she believes that she was just born unlucky. Dutta has done a good job, keeping today’s audiences in mind. The dialogue by his father O P Dutta is worth mentioning, and the attention to detail given in the sets is very impressive. The songs, penned by Javed Akhtar and set to music by Anu Malik, work after you see it on screen. Listen carefully to the lyrics, and the songs are as masterful as those in the 1981 film — though the music may not be. Then again, in terms of detailing, once could say Ash shouldn’t have worn a cap while performing the mujra. Caps of that kind were not worn in ancient Lucknow, and Nawabs of the area never wore the kind of turban Abhishek wears. But such minute details aside, the film transports you to the 19th century. The weakest link is Aishwarya’s dancing. Even though the steps were right, she lacked the grace of a courtesan. It looked like she was being told to perform; her expressions are very weak. 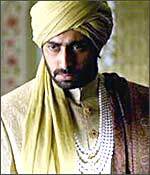 But that drawback is compensated for with her acting, and her scintillating chemistry with Abhishek. They have a great rapport on screen, and he often outperforms her. The actor is a treat. Watch the penniless and defeated Nawab Sultan walking out of Umrao Jaan’s brothel in pride only to tell Madam Khanum (Shabana Azmi) and Umrao that he will be back. That scene is worth applause. Shabana Azmi as Khanum Sahib is great, and makes you believe that she is ruling her kotha with an iron fist. The actress is simply too good. Sunil Shetty, Puru Raj Kumar and Ayesha Jhulka don’t disappoint either. If you are an avid lover of the Urdu language and Lucknowi tehzeeb, then the film is a must-watch. Others may not love it — the 20 reel film is over three hours long. This entry was posted on November 6, 2006 at 3:25 am	and is filed under Abhishek Bachchan, Aishwarya Rai, Umrao Jaan. You can follow any responses to this entry through the RSS 2.0 feed. You can leave a response, or trackback from your own site. Great article. Thank you for writing it. You have a lot of good information on your site. Do you have a favorite film? There are so many good ones, I cannot pick simply one, though I really enjoyed watching When Hearts Collide. If you have yet to watch it, I highly recommend you to do so. Thanks again for a very informative site! Visit my site if you’d like to read more. Kind regards!